Palestinian medics evacuate a wounded demonstrator during a protest at the Israel-Gaza border fence, in the southern Gaza Strip yesterday. A Palestinian woman was killed in clashes with Israeli soldiers along the Gaza Strip border yesterday, according to Palestinian sources. 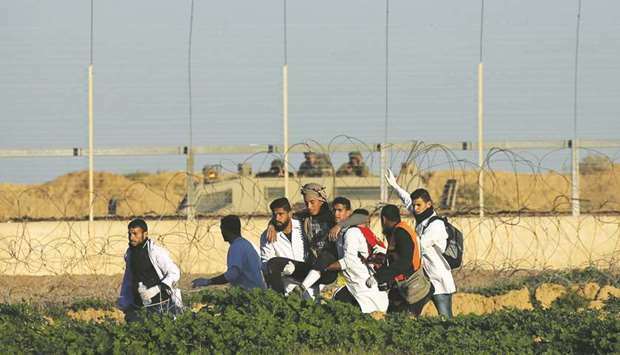 The Health Ministry in Gaza added that 25 Palestinians suffered gunshot wounds during the clashes. An Israeli soldier was hit by a stone and slightly injured, according to the Israeli army. The Israeli army estimated that some 12,000 Palestinians had gathered at various points along the border fence that divides Israel and Gaza. An army spokesman said that the protesters burned tyres, as well as threw stones in the Israeli soldiers’ direction. The Israeli air force later struck a base in Gaza belonging to the Hamas movement, which governs the coastal enclave. Hamas security sources spoke of two bases that had been attacked and destroyed. No injuries were initially reported. Two people crossed the border fence and entered into Israel before soldiers shot at them and they returned to Gaza, the spokesman added. Since late March, more than 240 Palestinians have been killed in protests along the Gaza border, according to the Health Ministry in Gaza. The demonstrators are calling for a right of return for Palestinian refugees who fled the area that is today Israel. They also call for a lifting of the blockade on the coastal enclave. In Gaza, around 2mn people live in difficult conditions: There is a lack of drinking water and electricity, among other things.